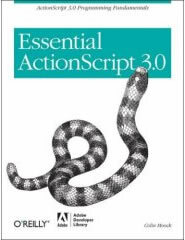 Today I woke up to an email from Amazon.com informing me that Colin Moock's new book "Essential ActionScript 3.0" was going to be delayed until August 24th. The book is still listed on their site as available for pre-order without an estimated shipping date, and after checking Powell's Books (Portland's famous bookstore) and Borders' website, I have found that neither of them list an available date. So if you are like me and have been waiting for this book to come out for months now... it looks like the wait will continue. Sadly, I have a feeling that due to Moock's overwhelming success with his prior books, many developers are waiting for the release to learn AS3. Because of this, I can't help but think that the delay in releasing this book has the potential to slow the overall adoption rate of AS3 in the interactive community. I’m bummed. I’ve been reading other as3 books… like the flex cookbook. Like you i’m waiting for colin to lay down the law. I was counting the days to get this book, sit down with it and finally get my hands into some code. I have literally sworn that I am actually going to DO all the examples… and not just read them. I’ve been doing as1-2 hybrid stuff for a long time and really need to dig into the whole oop thing. Yeah, I was really disappointed with the second delay. I find it funny that’s there’s no mention of it on Colin’s blog either, just another post about the first few paragraphs of each chapter. I’m just glad I took the Safari Books option so I can read the ~900 pages in advance. Still looking forward to the print version, but I guess I won’t be able to read it at the cottage this summer.